It’s been just over three years now. On Thursday, April 5, 2012, at around 1:30 p.m. EST, my brother Brian and I lowered our parents’ ashes into the grave plot of a Greensburg, Ind., cemetery. Sixteen years earlier, on Saturday, Sept. 14, 1996, we’d walked around the very same cemetery. 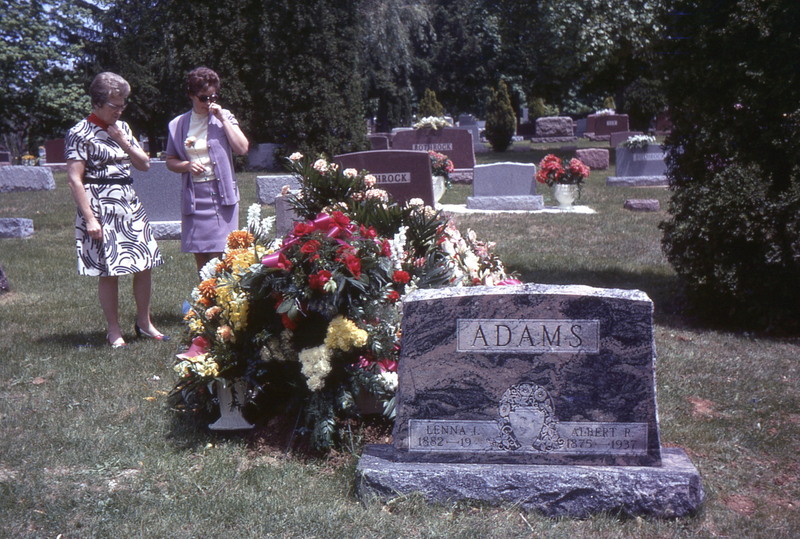 “Grandpa Adams died the following Monday night, Sept. 9,” the journal reports. He would have turned 96 that October. He’d lived a long and happy life. My brother, his wife Stacey, and I arrived for the funeral that Thursday, staying in Greensburg at Mom’s childhood home until we flew back to the Twin Cities on Sunday. Then Mom and Dad returned to their retirement home in Florida, where they’d been living for a year or so. I remember that meal well. It was at a German restaurant. There we were—the entire Family Project—laughing and telling stories about Grandpa. Sixteen years. Blink of an eye. Now it is late April 2015. Sixteen years from now it will be 2031. I’ll be 72. One year younger than Mom was when she died. But I am not my mother, my grandfather, nor my great-grandmother for that matter (all of us pictured above left, together in the early 1960s). And of course Ed’s not here with my sweepstakes winnings. I know, I know. For someone “not particularly fond of the past,” I seem to spend a lot of time there. Maybe, I think, there’s some mystery that can only be discovered by examining the past and the present—a kind of weird amalgam that will reveal the future by carefully mixing those two elements of time. Since the future element is uncertain, the only tools I have to discover that mystery are the diaries, journals, photos, letters—and who I am right now. It’s something to believe in, whether there’s anything there to hang your hat on. On Saturday, Feb. 28, 2015, I was hit by a white Nissan, in the middle of a crosswalk, on the walk light at St. Paul’s Grand Avenue. I saw myself going over the car roof, rolling off the trunk and into the intersection—directly under the wheels of the car behind the one that hit me. It’s true. Everything. Slows. Down. Take any normal day—that hubris most of us commit against “the sanctity of the present”: You’re on a walk light, minding your business, not hurrying, not distracted by a cell phone or music in earbuds, just walking across the street—and suddenly you’re dead. Seems improbable given those conditions, but there it is. The driver braked just as her car bumper connected with my left knee, leaving only a bruise for a couple of days. My friend Thérèse was in St. Charles, Mo., on Tuesday, Sept. 12, 2000. She’d arrived from Santa Fe, New Mex., to care for a young cousin stricken with Burkitt lymphoma. She’d hoped her cousin would join her for a walk down to the Missouri River. But when the cousin declined, Thérèse invited her father instead. Father and daughter rarely got to see one another so, after enjoying lunch, they crossed Frontier Park to sit and talk on the jetty. Atop a large rock, Thérèse’s dad suddenly turned and fell backward, headfirst, into the river. I flew to South Florida on Tuesday, Dec. 19, 2000. Mom and Dad picked me up at the Southwest Florida International Airport, just outside Fort Myers, and we arrived at their home in Englewood around 3:00 p.m. I’d be spending five days with them over the holiday. Thérèse’s father, James, was pulled from the Missouri River two days later. He was 66 years old. 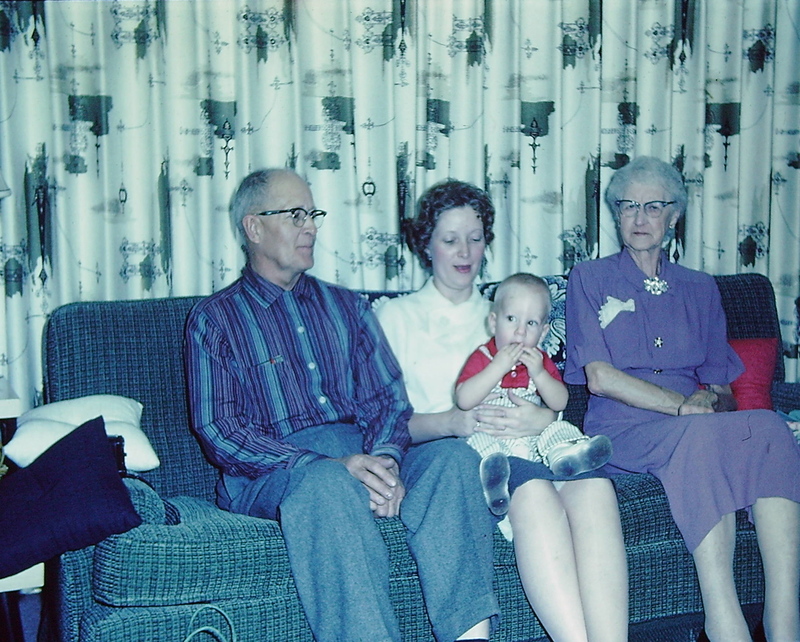 At Christmastime 2000, Mom was 65, Dad, 68, and I, 41. We got hit by a car. We survived. But then, eight years later. I didn’t think I could make it after they died. Not a lot made sense anymore. It’s like I’d become that toddler all over again, sitting on a sofa in the early ’60s. Except all the people around me had suddenly vanished, dissolving into the upholstery. As it is with everyone, that’s not an if, but The Big When. So, here—now—on this three-year anniversary, I’m happy to recall my brother, his wife, and I having lunch at a vegetarian café near our birthplace in Broad Ripple, just north of downtown Indianapolis. Out in our rented Honda, packed into plastic Baggies inside wooden boxes, lay the remains of our parents. Inside, we laughed, reminisced, and enjoyed our meal. Just like we did at Grandpa Adams’ funeral all those years ago. ~ by completelyinthedark on April 24, 2015. Republishing this chestnut while drafting all-new post for next Friday. Happy holidays, friends.